The value of a Lacrosse - 5 cents 1968 stamp depends on several factors such as quality and wear, supply and demand, rarity, finish and more. Values in the section are based on the market, trends, auctions and recognized books, publications and catalogs. This section also includes information on errors and varieties and characteristics. 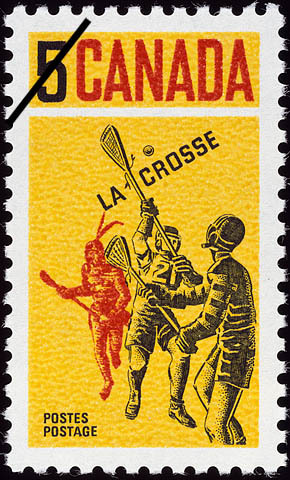 The game of lacrosse recognized by this Canada Post Office stamp has its roots deep in the history of the early native people of Canada. In varying forms it is known to have been an organized activity of Indians before Columbus completed his famous voyage to North America in 1492. Evolution of the game through the centuries brought major changes in the size of the playing area and the number of persons involved. The early Indian Baggataway, or ball game, more of a battle training than sport for tribal warriors, had tribe pitted against tribe or village against village. As many as one 1,000 men took part in these tests of endurance which are known, in some instances, to have lasted several days. Goals in the primitive era consisted of one or two poles set in the ground anywhere from 400 yards to 5 miles apart. Early explorers in North America reported variations in the rules governing the contests; there remained, however, one basic requirement: catching the ball or picking it up by hand was never permissible. Participants in the wild melees were exhorted to greater fury by women of the tribes who wielded stout switches as they followed the play on the sidelines. The lacrosse stick, two of which were used by each player in the early years, is acknowledged to be the source of the sport's present name. Upon their arrival white men had, in fact, renamed the game before they adapted it to their own pleasure. They likened the Indians curved webbed stick to a Bishop's crozier, this in turn became la crosse and lacrosse. There is little evidence that the game became organized as a sport of white men much before 1840. Doctor G.W. Beers, a Montreal dentist who died in 1900, is generally recognized as having first been responsible for the writing of rules in the late 1860's to govern field lacrosse as a modern sport. A playing area 125 yards long was established; the number of players on the field for each team was standardized as 12; sticks were altered, and a hard rubber ball was substituted for the Indian ball of hair stuffed in deerskin. In 1876 Doctor Beers toured the British Isles with the first Canadian lacrosse team to appear in that country. A major revision of rules in 1932 led to Box Lacrosse in which teams of 6 players compete in indoor arenas or enclosed outdoor boxes on a playing area with a minimum length of 160 feet.